From the archives of Rabbi Ben Zona comes a fake contractor scam. This is basically a 'we'll help you recover money from the people who defrauded you' 'format'. In this five-month gem, the scammer brings in a new version of himself - because the old one was a thief! - and then can't remember his new name. The Rabbi's exploits (only a few of many) include OOZING CAPITAL, A BIT OF BOTHA, CIRCUMSPECTION, and SPURIOUS. 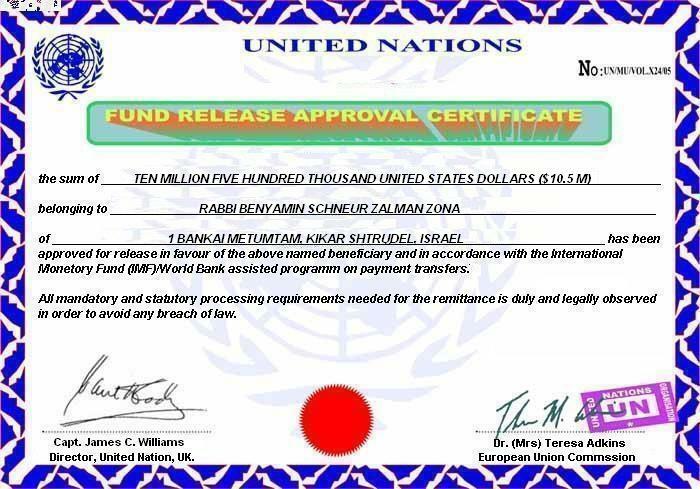 Timothy Wirth - "with the United Nations Organization"
or YOU OPEN AN ACCOUNT WITH ANY OF THE BANKS immediately before you respond to this Letter because they partner with these Banks and they are have been Authorized to Assist you in this Transaction. Kindly get back to us with a response so that we can commence immediately. Therefore, You are obliged to stop all communication with Individuals, failure to do so will lead to cancellation of this Transaction. And as soon as you do, more information would be faxed, E-mail to you on how it would be officially Released to you. However. So kindly get back to me through my personal E-mail as soon as you can so that we can proceed. I'm sorry, I don't remember the transaction of $10.5 million, though it might have been my wife. Can you please further enlighten me on this? Following the receipt of your E-mail which was well received by me. I wish to officially let you know that the content of your E-mail was well noted. However, We need you to know that we received directives from the WORLD BANK GROUP because this Transaction is a WORLD BANK ASSISTED PROGRAMMED. I wish to bring this to your warm Notification that you have been contacted in regards to the Released of some amount Total the sum of $10.5 Million United States. However, From the Files you happen to be the Beneficiary that was short- listed to claim this payment. Due to the procedure involved, The World Bank contacted us to be in communication with you so that this Funds would be Released to you without delay. But also, We were informed that you are required to provide the details below so that the WORLD BANK GROUP will match it with the ones on the computer data system and once this is done the confirmation of your Funds would proceed. Finally, We have secured some paper works and also the World Bank made us to understand that this Transaction has been Announced for the Approval of your payment. Kindly get back to me with details as requested from you and also for more confirmation of your payment. You have a very quirky and flowery flair for the English language. Are you a native speaker? Why would the World Bank be involved in a simple transaction? I don't remember working with them; why would it be ASSISTED PROGRAMMED? Good Morning. How are you doing Today? I wish to let you that you E-mail was well received and as you have advised that my English Language is very quirky and flowery. Be advised that it is the way you Understood it. However, I must let you know that there are paper works from all Offices involved with this Transaction and also be advised that some of your information did not match with the ones on the Computer data system and they are as follows. Kindly give details of the information below. As soon as you have confirmed the following I would be willing to provide some paper works on your behalf that claims you are the rightful owner of the Funds. Kindly get back to me as soon as you can. Great to hear from you once again. I consider myself advised under your quirky and flowery recommendation that that is indeed how I have understood it. I also acknowledge your warm notification regarding the WORLD BANK ASSISTED PROGRAMMED, but am slightly confused that my information, provided both warmly and under advisement, how my information doesn't match with what you have on file. Pray, what information do you have on file for me? I am quite sure that in my last email, which you advise me was well-received, contained the information that you currently seek. Am waiting for your paper works with much warm anticipation. Good Morning, How was the Weekend? I wish to inform you that your payment has been confirme because the information has been confirmed by the WORLD BANK GROUP because there was a Typographical Error in the First place. Be advised that your paper has been Approved by the WORLD BANK and from the meeting it is confirmed that you decide how you want your Funds to be Released to you from the options below. You are advised to get back to me as soon as you get this because this payment has been Announced by the WORLD BANK GROUP and Authorized to be Released to you. The weekend was but a distant memory, it being Wednesday already, but thank you for asking. I will be so glad when the WORLD BANK releases my capital. If by the first option you mean bank-to-bank transfer, that's the one I want. Delivering a wad of notes to my doorstep will only arouse the suspicions of the neighbours, the police, and but most of all my wife, Chaya Mushka. Knowing that woman she'll take it all straight to the sheitlmacher. All this for only a typo! Who would have thought. Good Morning to you. How are you doing Today? I wish to officially let you know that the content of your Email was well received by me and also want to inform you that I am making all the Arrangements involved to have your CAPITAL Released to you because you are the owner of the funds, Because the WORLD BANK GROUP has short-listed you as the rightful Beneficiary to the said Funds. A meeting was held on your behalf yesterday concerning the Arrangements and involvement in having your payment Released to you through the MODE and OPTION previous listed for you to decide on how your want your Funds to be Released. which are below. It has been confirmed by the UNITED NATIONS ORGANIZATION that all the paper works required to have your payment Released to you has been confirmed OK and also the WORLD BANK GROUP and the INTERNATIONAL MONETARY FUNDS has confirmed all paper works. But Today, You have decided that you have to have your payment Released to you through a BANK TO BANK TRANSFER which is known as SWIFT TELEGRAPHIC WIRE TRANSFER because Delivering a wad of Notes of Boxes to your Door step would arouse the suspicions of the Neighbors, the police, and but most of all my wife, Chaya Mushka and you would not want that. However, I wish to let you know that you are advised to provide the Account details where you want your CAPITAL to be Released to. 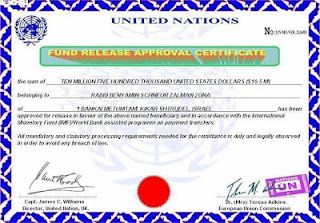 and also NOTE THIS I have attached a copy of the APPROVAL DOCUMENT of your payment from the UNITED NATIONS ORGANIZATION. IF YOU TAKE A LOOK AT THE DOCUMENT YOU WILL SEE THAT THERE IS NO SIGN OF THE WORLD BANK GROUP SIGNING, AND STAMPING this is because they made us to Understand that you have to get the STAMP yourself and we made them to Understand that there was no way for you to get it. Your payment can not be Release if the WORLD BANK GROUP do not APPROVE this Document. So therefore, I have made Arrangements with the WORLD BANK GROUP and was advised that it would involve a fee of $950 to stamp on this DOCUMENT, We never knew that such would come up. I want you to know that I have done all I could to see if there was something that could help but nothing. How is your Weekend? I hope that all is well with you? You have refused to Write me after I told you the involvement of the Transfer of your Funds Bank to Bank. What is Happening? Hope all is well with you and your family? Get back to me because the Office incharge of your Funds Release have started complaining about delay. All is well with me. I have not refused to write to you; rather I have simply refrained from doing so in a timely manner. Now then, as for the CAPITAL to be raised for my STAMP, I am concerned that an OFFICE in charge of FUNDS RELEASE has chosen to COMPLAIN about anything. What could possibly be the nature of the COMPLAINT? Is the actual CAPITAL sitting on SOMEONE'S DESK and is LITERALLY IN THE WAY? I would like to speak to SOMEONE at the OFFICE IN CHARGE OF THE FUNDS RELEASE. Pleased Reading from you Today. You have advised that you want to speak with SOMEONE at the OFFICE IN CHARGE OF THE FUNDS RELEASE. And I am providing a Telephone Number so that you can call the Official incharge of your Funds Release to you. This is a Direct Number you should call. +234-816-661-4357, And He is in the person of Mr. Adam Smith. I will be waiting to read from you after speaking with him. I couldn't help notice that this number has a Nigerian country code. I just read something in the news that someone lost thousands of dollars sending money to Nigeria for untold and imaginary riches. How do I know that this isn't one of those schemes? Of course I'm only a fictional rabbi, but that's not the point. Thank you for your e-mail. The content therein was well received and your E-mail was well noted. YES, The Telephone Number that was provided was a Nigerian Number. I gave it to you because the Office in-charge of your Funds Release is located there in Nigeria. And the Office was Appointed by the United Nations Organization. Be rest assured that you are dealing with the right Office for the Release of your payment. However, I want you to Understand this that there are SCAMS all over the World. But I need you to know that this is not a SCAM and as long as am concern you will get your payment as advised by the WORLD BANK. I have provided a paper work for you which claims your FUNDS APPROVAL. Please you alone is delaying this Transaction. Thank you for your Understanding. Good Morning. I sent an E-mail to you yesterday but you did not respond. I need to know what is Happening. Do you want us to proceed with this Transaction? As I have assured you that this is a Legal Transaction and not a Scam. We shall be waiting to read from you in less than 24 hours. Thanks for your Understanding. How are you doing? I hope this Message meets you in peace. I need you to know that I have come to you in regards to your Funds Release and not because of what you hear about the Country where I am presently working. Be advised that all I need you to know is that this Transaction is a Legal Transaction and I know that you will have your Funds Released to you as I assured you. I was wondering why I hadn't heard from you for a while. Don't know why your emails keep arriving in the Spam folder. This one was buried between a requests to hook up with a beautiful Russian woman and a message exhorting me that Chaya Mushka would be better pleasured if I had a longer schmeckle. I do hope that there are no further complaints that my money is not inconveniencing someone. In any case, why wouldn't I still be interested in this transaction? On the other hand, I can I take your assurance at face value? ... and got a response! Pleased reading from you. You are the one that I should be asking why you never did responded to my E-mail. Well, Your Funds are still intact. OK? Thank you for your E-mail, Your Funds is not inconveniencing anyone. OK? Since you are still interested in getting this done I was expecting you to act accordingly as I advised you because the payment office in the United States are expecting to get the the CAPITAL to be raised for my STAMP involved. Where is the payment office in the US located? I will be travelling there shortly on business and can take care of all this in person. The payment Office is in the United Nations Organization Head Quarters in New York. Excellent! I'll be in New York next week on other matters. Who should I ask for when I get there? Once you get to New York. Get to the UN Head Quaters and ask of Mr. Allen Adanson. Customer care unit. Are you having me on? There is no Customer Care Unit at the UN. Sequel to the receipt of your E-mail. Who is having you on? You must know that I have been loyal to you but do not use such words for me. However, I advised you to communicate with r. Allen Adanson. Customer care unit at the UN Head Quarters in New York. So if you want this Transaction completed do what you have been told to do. Apparently, the UN did had a customer care 1-800 hotline that they shut down a few years ago because Kim Jong Il kept pranking them. How can your man work in a department that doesn't exist? Going through your E-mail hurt me so much because I am really confused of what you want me do to do for you. Firstly, I advised you of the requirements involved to have your Funds Delivered to you officially. You refused the offer and advised me that you want to go the the United Nations Head Quarters and get things settled that I should give you someone to communicate with once you get there. I informed you that you should communicate with Mr. Allen Adanson. Customer care unit at the UN Head Quarters in New York. Now, You are telling me that the UN did had a customer care 1-800 hotline and it was shut down few years ago because of Kim Jong Il kept pranking them. Now, Be informed that this Kim Jong Il you just mentioned is the leader of the Democratic People's Republic of Korea (North Korea). He is the Chairman of the National Defense Commission, General Secretary of the Workers' Party of Korea, the ruling party since 1948, and the Supreme Commander of the Korean People's Army, the fourth largest standing army in the world. And I do not see what concern him about the UN. Finally, If you know that you are not ready to get this done just inform me and I will advise the World Bank Group to have this Transaction canceled. I know exactly who Kim Jong Il is, though I didn't know that his army is the fourth largest standing army in the world. I hoped you learned something. What would we do without Wikipedia, eh? All I informed you is that there isn't a customer care unit at the UN. That's now how the UN works. The United Nations (UN) is an international organization whose stated aims are facilitating cooperation in international law,international security, economic development, social progress, human rights, and achievement of world peace. The UN was founded in 1945 after World War II to replace the League of Nations, to stop wars between countries, and to provide a platform for dialogue. It contains multiple subsidiary organizations to carry out its missions. I don't know where you got your intelligence, but I'm guessing you haven't any. I don't know why you should feel hurt; please don't take this to heart. You talk as if I've affected your soul. Have you had a rough upbringing? You can talk to me about it, friend. I am a trained counselor, you know. I am David Waterr From UK an official in the custom service. Fortunately for me it happens that i am one of the effective officer here in the UK assigned for proper exercise for severe inspection of warehouses and bank here in the UK due to numerously bomb blast erupting the country. To my greatest surprise we observed/detected a consignment in a secret room in UK	Tagged the information of MR.BENSON WATER as the owner of the consignment. We have to observe a severe instigation to ascertain the real owner of the fund. Severe investigation commenced and observed that the dishonest MR TIMOTHY WIRTH masterminded the whole thing by diverting your payment.This evil act was done due to your inability to claim your funds with the company because you did not observe the procedure of the financial institution	that would have granted you claims. For this reason, he planned to run away with your funds for his own benefit but unfortunately for him our strong exercise detected is miscreant and immediately retrieve your cargo and lodge it with a safe cargo company here in UK . WE ARE SUPPOSE TO BRING OUR DETECTION TO THE NOTICE OF THE BRITISH GOVERNMENT BUT DECIDED TO MAKE IT A DEAL WITH YOU BECAUSE IF WE ALERT OUR GOVERNMENT THAT WE DETECTED SUCH A HUGE AND SENSITIVE CARGO,IT WILL BE A GREAT LOSS TO US AND OUR GOVERNMENT WILL USE THE FUNDS	FOR GOVERNMENT PROJECT. You are required to forward us your details urgently to enable us forward them to the company for release of the cargo to you as the legitimate owner of the funds. You are hereby advised to respond to this message as soon as you receive it for immediate claims in your favor. What a complete surprise! I just wrote to young Timothy a few moments ago. What has happened to him? David Waterr - or Alan Russell? I received your positive response towards my email. I know that you will be skeptical to receive my message due to someone you have not met previously disclosing your outstanding claims and urge you to claim it for our future benefit. We confined in you to handle this deal perfectly and secretly without any delay because we suspected that it is because of the delay you observed the time you suppose to receive your payment that warrant the dishonest officer to abs corn with your funds so you have to be up and doing this time around to get the deal done immediately to avoid other obstruction. I want you to know that the key success of this deal is trust, sincerity and commitment to ensure that this deal works out fine as planned, so i hope we can count on your trust in this deal? It is good you specify what share you are going to give to us in this deal for securing your funds $25M for you without making away with it? so that deal can commence immediately. Upon disclosing our share in the deal, we will immediately forward your details sent to us to the cargo company where the consignment is lodged for release of the consignment containing the funds to you as the real owner. Most importantly, we can not transact the deal ourselves because we are still in the service of the government and can not afford to be detected in such deal because if eventuality we are caught in this deal, automatically we will be jailed for our dishonest act so we need to protect our dignities for safety reasons. LET SECRECY BE OUR WATCH WORD IN THIS DEAL FOR SAFETY OF OUR DIGNITIES AND THE MILLION OF DOLLARS. Bye for now and reply me ASAP. If this is just a matter of me recovering the funds that are supposedly mine, there is no "deal", and it has nothing to do with trust, sincerity, or commitment on my end. Just return my funds and get on with it. What possible hitch could there be? Are you going to start charging ridiculous administration fees or will you too abscond with with my money? David Waterr - or David Alan? I don't understand your drift, I contacted you with sincerity of purpose and I am willing and in position to assist you recover your left luggage and that�fs all. Statutory charges associated with delivering to your address the consignment under a diplomatic parcel with full diplomatic immunity. Looking forward to hearing from you ASAP. You never did tell me what happened with Timothy Wirth. I haven't heard from him for a while. Why also is there a diplomat required? I didn't know I was expecting a parcel. I thought it was just some money I was getting. I understand your skeptical to receive thjs message due to someone you have not met previously seeking for your hand for claims of your outstanding funds. Be rest assured that this deal is real and substantail,you are safe and secured dealing with me with any regret. Timothy Wirth is the master minder of your payment, he masterminded your payment and secretly packaged your funds it in two trunk boxes and hide it in a secret room where we detected it as unclaimed funds, so this sole called Timothy Wirth is a thief , you are warned	to stop every communication with him to avoid any harm to you or your entire family. It was because he was assigned to process your payment lead him to mastermind your payment out of wickedness but you have to thank your God that we the sincere officers detected your funds and urgently alerted you for claims, so you are required to co-operate with us so that your claims can be done in the next possible time without any hitch. I require you to forward me your details below so that i can forward your details to the company where we secretly lodged your	funds immediately we detected so that they can release it to you as the real owner. DO NOT HESISTATE TO EMAIL EM URGENTLY AS SOON AS YOU RECEIVE THIS EMAIL TO ENABLE THIS DEAL COMMENCE AS PLANNED AND IF I MAY NOT FORGET,WHAT WILL BE OUR SHARE IN THE DEAL FOR HELPING YOU TO SECURE YOUR PAYMENT? THE FUNDS IN THE LUGGAGE IS $25M,SO WHAT IS OUR SHARE? I'm sorry, what is your share? Are you entitled to anything or is this some baksheesh of some sort?